Seventy five years ago the first commercial flight across the North Atlantic was operated by Pan American Airways when the ‘Yankee Clipper’ flew from New York to Foynes, Co. Limerick. 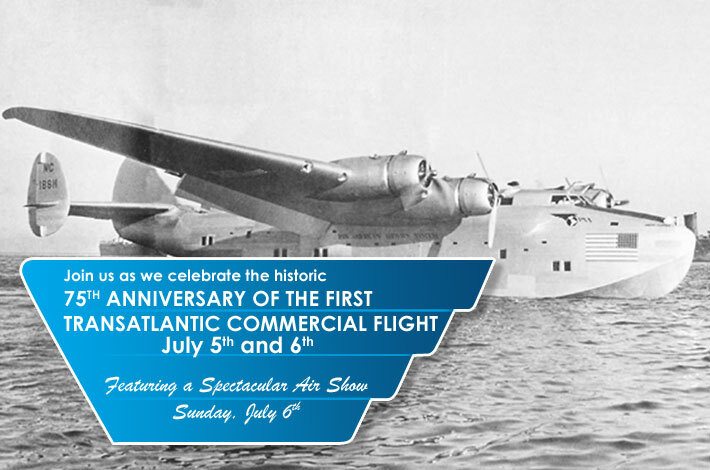 This key moment in aviation history will be celebrated with a special two-day event on July 5th and 6th organised by the Foynes Flying Boat and Maritime Museum. The event will include a concert, gala dinner and fireworks display on Saturday 5th and events on Sunday 6th will include a three hour air show over the river. Special guests will include Frank Gray, son of Captain Harold Gray who was the captain of the ‘Yankee Clipper’. Air Contractors is delighted to confirm that one of the airlines ATR-42 aircraft based just across the river in Shannon Airport will participate in the air show. In February this year Air Contractors operated its first Boeing 757 trans-Atlantic service for Aer Lingus from Shannon to Boston, and the following month a second B757 began flying between Shannon and New York. Colin Grant, Chief Executive of Air Contractors said “Aviation in the Mid-West has come a long way in a short 75 years, from the ‘Yankee Clipper’ in Foynes to our own two daily round-trip flights between Shannon and the United States, operated for Aer Lingus”. Hugh Flynn, Chief Executive of ASL Aviation Group, one of the sponsors of the event, said “Aviation is a special industry and it is right that we should celebrate the amazing achievements of the last 75 years, and the people who opened up transatlantic air travel as such a vitally important business, tourism and family link”. “The Foynes Museum itself is a remarkable achievement and its deserves our support for the excellent way in which it portrays and honours the pioneers of what, for us, has become the everyday possibility of trans-Atlantic flying”.